Long Drive champ, Jeff Flagg brings his power to the course. 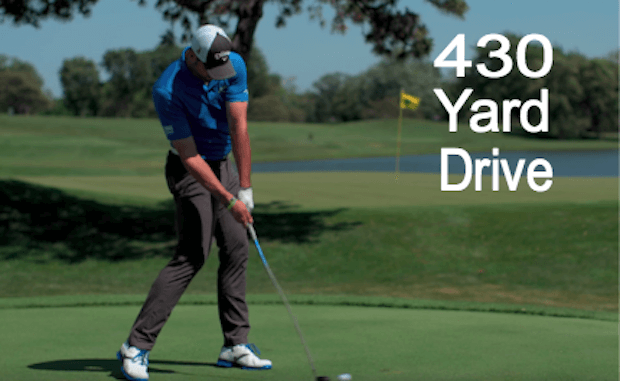 Jeff Flagg was recently challenged to drive the 14th hole at the Butler National Golf Club in Oak Brook, Illinois – a 430-Yard par 4. Coming from his background of competitive long driving, he was more than willing to have a crack at it! Adding to the difficulty of this drive, he would have to carry the ball the entire distance, as the green is protected by a giant lake leading up to the front of the putting surface. After a couple of successful warm-up shots from the front tees, Jeff heads to the back tee to attempt the challenge. ‘SHARE’ with your friends if you ‘LIKE’ this video.